“Almost a Celebrity” is the no-holds-barred autobiography of radio megastar James, a man who, for over thirty years, has never been afraid to say the unsayable. In his typically deadpan style, “Almost a Celebrity” charts James’ rise to the top – with plenty of trademark rants along the way – from his Surrey childhood, where he avoided school by hanging out in Soho strip joints, through his humble beginnings in local radio, via the self-titled TV show which made his name, to his current status as late-night king of the airwaves. Throughout his life, James has never been a stranger to controversy. His outspoken opinions have led to numerous TV and radio watchdog enquiries, death threats, and even his arrest. In 2000, he confronted his toughest opponent so far, when he was diagnosed with cancer and given only months to live. An inspiration to millions, James Whale is a genuine man of the people. And – as usual – there’s no stopping him from telling his story in his own entertaining, inimitable way. 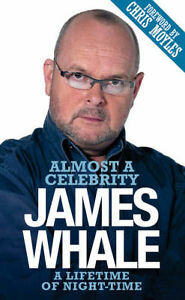 If you have ever listened to James Whale on the radio, this book does not dissappoint. With strong opinions, this book talks about his lifetime and career, including his diagnosis with illness and how he came through it. With an excellent forward by Chris Moyles, who, like me, listened to James Whale on Radio Aire in the 1980’s – sometimes underneath the bedsheats – this is an excellent read. Unwrap it, read it and underneath the hard exteria you will find a soft centred man. Just click the link above and register with Audible. Look for my book and download. All Free! If you want just cancel the trial! The Butterfly Boy takes the reader on a dramatic, sweeping journey through two World Wars in Germany and races on around the globe throughout that tumultuous century. Born in a sleepy German town Arnie rises to become one of Hitler’s favourite artistes despite his handicap and his Jewish mother. Arnie risks his like to undertake covert activities for the allies and the Christian resistance movement. Arnie matures into a great handsome bull of a man, who, despite not having the use of his arms still manages to be a great womanizer and hell raiser. The conflict between Arnie and his childhood nemesis, now senior Nazi officer, Ratwerller, is a battle to the death that slashes through their lives like a sharpened razor. They stop at nothing to seek the destruction of one another. After the war Arnie, The Butterfly Boy, builds the Mouth Painting Charity around the world from which he makes tens of millions of dollars whilst destroying anyone that stands in his way. But it is his own waywardness and his unresolved past that haunts him. This is the story of an extraordinary man, taking an extraordinary journey during extraordinary times. You will love and fear for Arnie, and be hypnotized by him.